We have recently released a number of new features to your Ubi platform. All of these features aim to optimise the way you monitor and manage your energy. If you are a battery customer, you will now get automatic notification via SMS when there is a power outage. This is to ensure that you are aware that your property is running on battery power. Data on the Charts page of the Mondo Portal will be available for any seven-day period, not just last week (see example below). 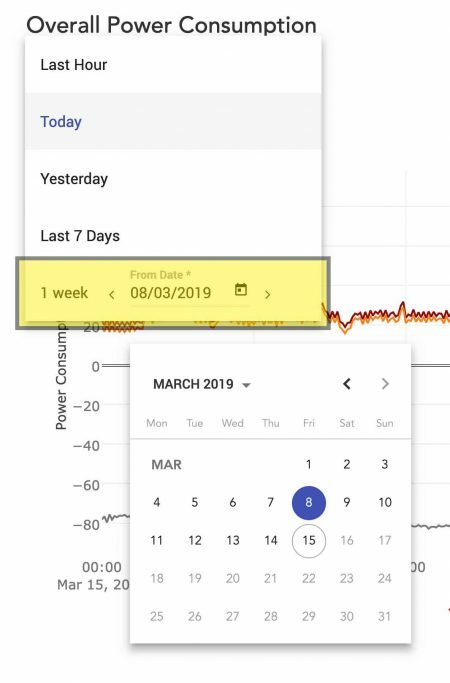 The “Yesterday You” section of the Mondo Portal is being updated to provide greater clarity on yesterday’s energy to better highlight how much of your generated energy was used versus how much was exported to the grid. Increased frequency of helpful hints and notifications. Ability to download a CSV spreadsheet of your energy data through the Mondo Portal. Ability to charge your battery from the grid. This allows for off-peak charging from the grid when a cloudy day is forecast. Personalised reports highlighting how you are using energy. These reports will highlight the impact of your solar and battery assets in an easily digestible format.